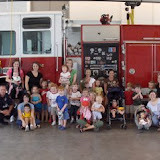 I'm hopelessly behind on blogging, and I'm not going to try to catch up, but here are some pictures from a visit with my moms group to a fire station a couple of weeks ago. It was Adam's first visit to a fire station, and our first outing in our new (to us) van. Afterwards, we cara(mini)vaned to McKay's Mill for a picnic. There are four other babies near Adam's age in the group, and it was so much fun to watch them interact!